“Eco-bricks” are bottles stuffed with inorganic trash – chip bags, candy wrappers and scraps of plastic – for added insulation. They’re used in building schools, as these kids are helping to do at Santa Rosa San Martin Jilotepeque, Guatemala. A student helps out by stuffing inorganic trash into a plastic bottle at Sepalau Alta Verapaz, Guatemala. Joshua Talmon, secretary/treasurer of Hug-It-Forward, doesnt just sit at a desk. 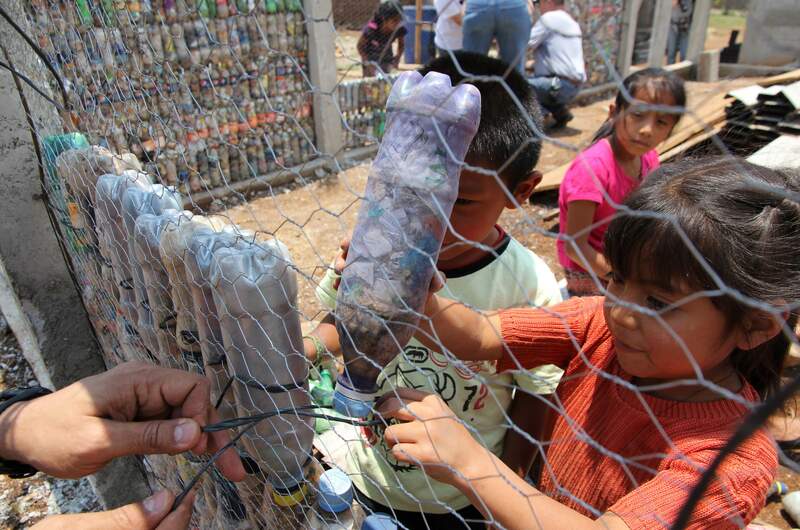 Here the Fort Lewis College graduate places bottles, or eco-brick, in a wall at a school in El Molino San Martin Jilotepeque, Guatemala. 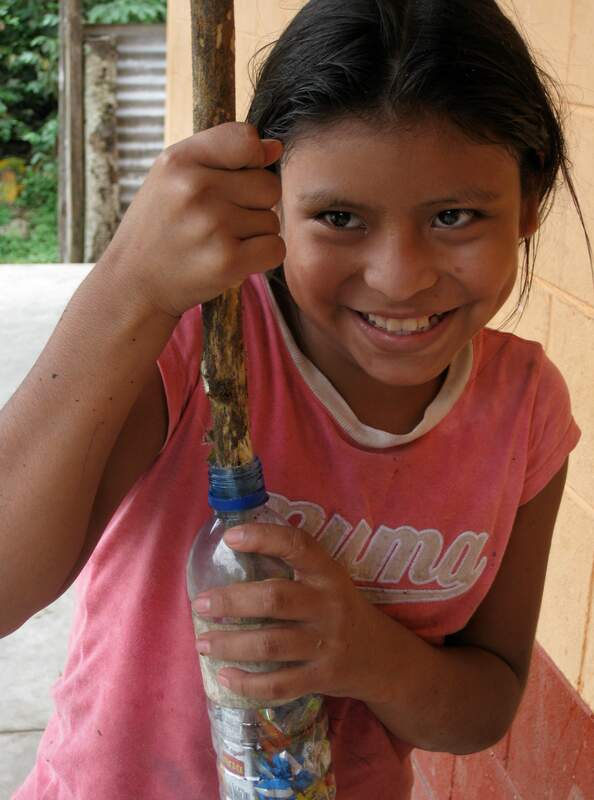 The construction of simple, functional schools in Guatemalan villages using recycled plastic bottles is empowering native inhabitants and creating international good will, says a former Durango resident involved in the 3-year-old project. Twenty-one bottle schools have been built so far, 20 in Guatemala and one in neighboring El Salvador, said Joshua Talmon, the secretary/treasurer of Hug-It-Forward, a name whose origin is easier left unexplained. Village leaders, parents and children, young and old, contribute labor, as do visiting Hug-It-Forward corporate sponsors during weeklong stays, Talmon said. Peace Corps workers were early sources of tips on where a school was needed, Talmon said. But as word of Hug-It-Forward projects has spread, the pace is increasing. A typical two-room Hug-It-Forward school has a post-and-beam skeleton, concrete floor, metal roof and walls made of 6,500 recycled plastic bottles encased in sections of chicken-wire netting. The walls get a final coat of stucco inside and out. The bottles are stuffed with inorganic trash – chip bags, candy wrappers and scraps of plastic for added insulation, Talmon said. Construction takes three to four months at a cost of $10,000 to $12,000 per school. Corporate sponsorships and public donations pay for building materials and on-the-ground expenses. The municipality of San Martin Jilotepeque, similar to a county seat, pays the salaries of two skilled masons from the local community who oversee the work, Talmon said. This contribution gives the municipality a sense of involvement, he said. Gerson Guitz, a Guatemalan, is the Hug-It-Forward in-country director. He is the liaison to village leaders and oversees projects. The typical village is at the end of a dirt road, Talmon said. “We’ll build a new school or replace dilapidated infrastructure,” Talmon said. “We’ve found village schools without enough space, so some students can’t attend, or villages where instruction is given under a tree. If it rains, there’s no class. Lush Cosmetics, headquartered in Vancouver, British Columbia, has sponsored two schools and is sending 20 executives and employees to Guatemala for a week in February, Talmon said. The Manifest Foundation has sponsored more than 10 schools. San Martin Jilotepeque is the base of operations. Visitors stay in a basic hotel there and are shuttled daily to the job site. They spend half their time at the school, participating in the work. The rest of the time they sightsee and learn about the host country’s history. In a sense, a finished school is a byproduct of a process that brings villagers together in a common cause (families with children in school must join the effort), promotes international understanding and instills environmental awareness, Talmon said. Talmon received a degree in business from Fort Lewis College in 2005. He worked in real estate in Arizona and California before joining Hug-It-Forward. He helped build the second school.